See our fun party food ideas. You can tailor all of these ideas by changing the color of the sprinkles, frosting or chocolate. 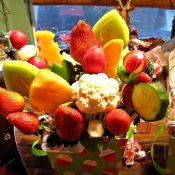 Or arrange it in a theme decorated container. See our selection of treats to dress up the party table! For more ideas, be sure to check out our other site Teaching Tiny Tots which has a great selection of party ideas, crafts and party favors. 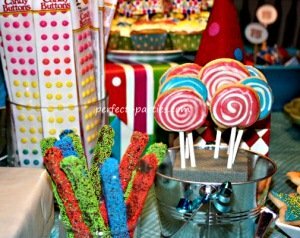 Here are a wonderful selection of birthday party resources.